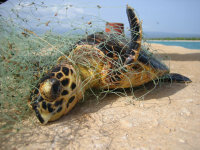 Incidental capture and mortality resulting from interaction with drift/gill nets, set nets, encirclement nets, longlines, seines, trawls, pots, and traps is one of the most serious contemporary threats to sea turtles around the world, including in the Caribbean Sea. Because sea turtles must come to the surface to breathe, they can drown after becoming entangled in fishing nets and other gear. 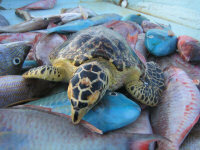 Various estimates of the global bycatch reach into the many hundreds of thousands of sea turtles dying every year. Countless others are left with amputated flippers, large hooks lodged in their bodies, and other debilitating injuries. In recent years many governments have responded by funding basic research, requiring better data collection, and adopting time and area closures, gear restrictions, and onboard fishery observer programs. 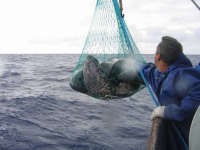 Conservation advocates, fishers, gear manufacturers, researchers, and other stakeholders have put forth similar efforts to quantify the extent of the problem, identify hot spots, forge solution-oriented partnerships, develop “cleaner” fishing techniques, certify and market sustainable seafood, and so on. 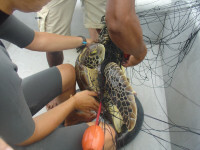 Protocols are increasingly available that significantly reduce the number of sea turtles caught, as well as provide fishers with techniques and tools to help reduce the trauma associated with entanglement or hooking. If a traumatized sea turtle is fortunate enough to be admitted to a sea turtle hospital, it can often be rehabilitated and released due to the efforts of skilled veterinarians and dedicated volunteers. 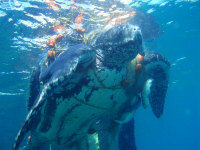 The lessons learned from these cases have meaningfully advanced sea turtle medicine. Consumer: Purchase and advocate for sustainable seafood, be “ocean-friendly”in your seafood choices, and look for seafood that has been certified by the Marine Stewardship Council. 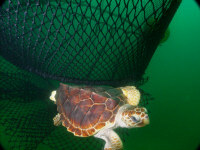 Fisher: Use “turtle-friendly” gear, be aware of handling and release protocols that can minimize injury to captured sea turtles, respect fishing regulations and sea turtle protection laws, and keep accurate records. 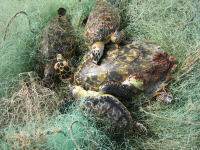 Policy-Maker: Adopt ecosystem-based policies for fisheries, require “turtle-friendly” gear (for example, Turtle Excluder Devices in trawls and circle hooks on longlines), require the live release of incidentally caught sea turtles, support research into reducing sea turtle-fisheries interactions, promote strong fisher livelihoods based on sustainable fisheries practices, implement data collection procedures, and strengthen fisheries enforcement.